One of the many things that make indie titles appealing to me, is the huge amount of imagination put into them. 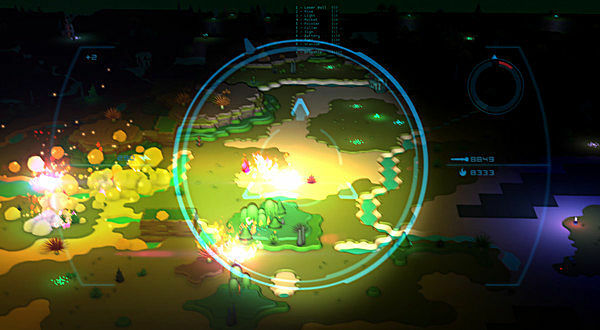 Indies are not afraid to try new things, due in part to the lack of a publisher to answer to. Due to this, over the past few years we have had some spectacular titles. We have all forms of genres redefined by indie devs including RPG's, roguelikes, horror and strategy. A recent title that entered Steam Early Access called OBEY, is attempting to change how we play multiplayer King of the Hill style games. 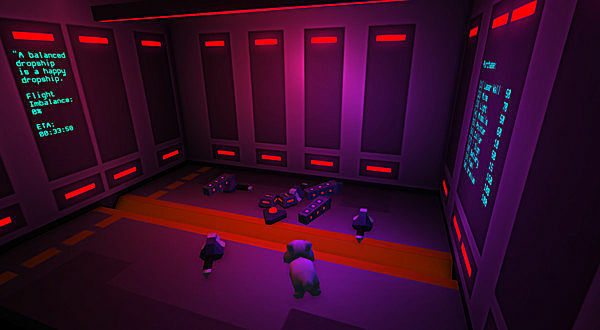 OBEY is an asymmetrical multiplayer title currently in Steam Early Access. It is developed by sole developer Dez and published under The Lo-Fi Apocalypse Ltd. In OBEY you have the opportunity to command other players into doing your bidding, but don't expect everyone to do as they are told. Not to mention, others have the ability to do the same to you. Essentially OBEY is a four player free for all King of the Hill style match play. 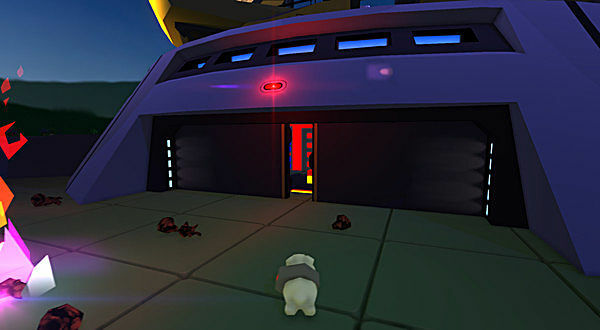 Each player controls a white bunny. The goal is to be the first one to reach a certain amount of money. 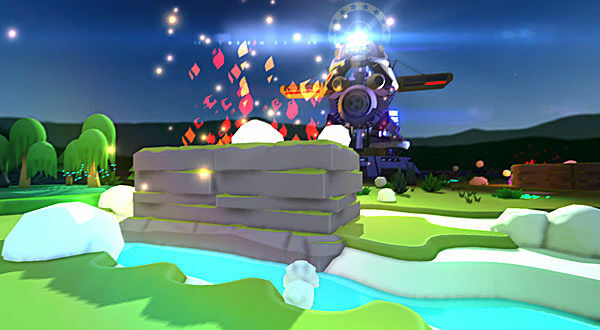 Once a player enters the giant tower, pictured above, they have full control. Here you can give the other players instructions telling them what to do. As to whether the other players listen to you or not, is up to them. Just remember that their goal is the same as yours and they will attempt to take over the tower as soon as they can to gain control. While you are in the tower you gain more money than you otherwise would outside of it, hence why everyone wants to gain its control. 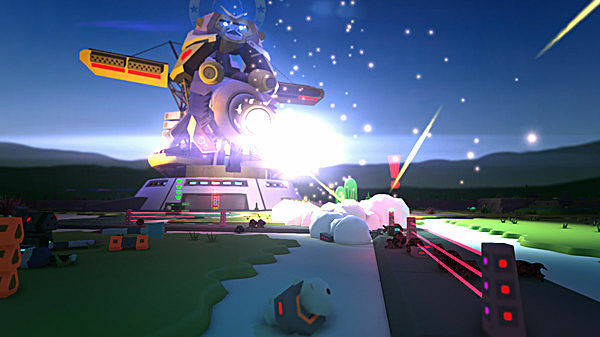 The tower has three weapons on it, a huge machine gun, a flamethrower and rocket launcher. So there is plenty of destruction to be had if someone doesn't do as they are told. 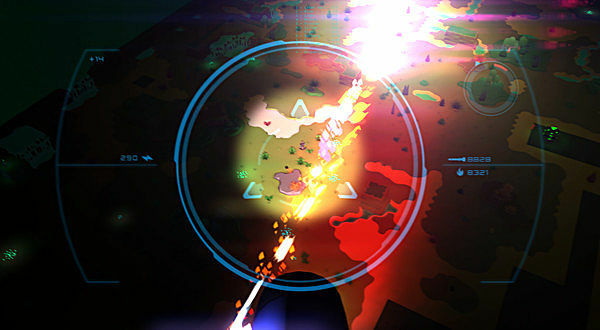 The concept is unique and offers a very different experience of typical King of the Hill gameplay. It causes players to be tricky and often pretending to be friendly by telling you who is betraying you while really they too are plotting your downfall. There are tense moments, particularly when scores are tight in general good old fashioned multiplayer style. The problem is, it is a difficult game to comes to grips with. The tutorial for OBEY is shall we say... a bit uninformative. As opposed to explaining exactly how all the game mechanics work, it is very straightforward "this is that" and "that is this." It doesn't explain in detail exactly what it is you are doing, you simply have to assume or figure it out for yourself. While the core mechanics are easy enough to figure out it is the smaller details that are not so well explained. For example respawning, picking up and using items as a bunny and as for the commands while you are in control, I don't have the foggiest idea what the hell they mean. It tells you how to do all these things but that is it. The tutorial doesn't explain in detail why they are useful or how they help you in winning the match. When it came to actually playing against other players I was clueless. I ran straight to the tower and took control. After that I had people shouting at me to "corpse this person" and I had no idea who the hell they were. Before I knew it was in a drop ship because I lost control and I had no idea what the hell was going on. Inside the drop ship was a list of things to buy but again I had no idea what I was doing. In a single player game where you get a chance to figure things out at your own pace, this wouldn't be so much a problem. But when you are playing against other people who know how the game works it just becomes more of a stress than a joy. The ill informative tutorial really did impact my experience, I honestly didn't have a clue what was going on. The main goal and mechanics of the game are easy to understand but the smaller details are nearly impossible without practice and research. The one thing I will say about OBEY is that for an Early Access title it runs like an absolute champ. The frame rate stays at a constant 60 FPS even when things are getting chaotic and a rainstorm of bullets are flying around. The controls are responsive, not once did I have any troubles controlling the bunny or the tower. Visually it looks really good and the art style they go for works really well. I simply can't fault the game in any way from a technical standpoint and that makes it even more painful when it comes to generally not liking the game. I really do want to but right now I don't. I love what the developer is going for with OBEY. I love the fact that they are being brave and going for something completely different. I would go as far as to say that they have succeeded in that regard, it is unique, there isn't anything else out there and it is genuinely a good game. The problem is I find it so hard to get into it due to its tutorial. Looking past that, however, I see a game that fans of multiplayer titles will enjoy. 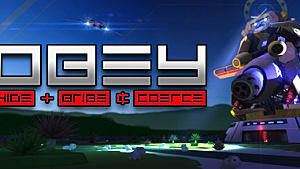 OBEY would be a great game to play with a few friends over a couple of beers during the weekend. There is bound to be a good time to be had. The thing that saddens me most about the game is the fact that I feel it is going to be more a novelty than a hit. Unless there are some serious additions to the gameplay such as new modes and the likes, it is a game that players would play a few rounds in and forget until about six months later. Like I said, it is a good game, but if it is to stay relevant in such as fast moving market, it will need a lot more content than it has right now. Even with the developer running tournaments every Sunday at 5 pm US Pacific Time, that alone isn't going to be enough. I respect and appreciate OBEY and what the developer is attempting to do even if I don't actually like it right now. I really don't want to see this clever and imaginative title becoming just another obscure indie game that gets forgotten about. But if new match types and gameplay mechanics along with a revamped tutorial were to be introduced, it may just save it from obscurity.